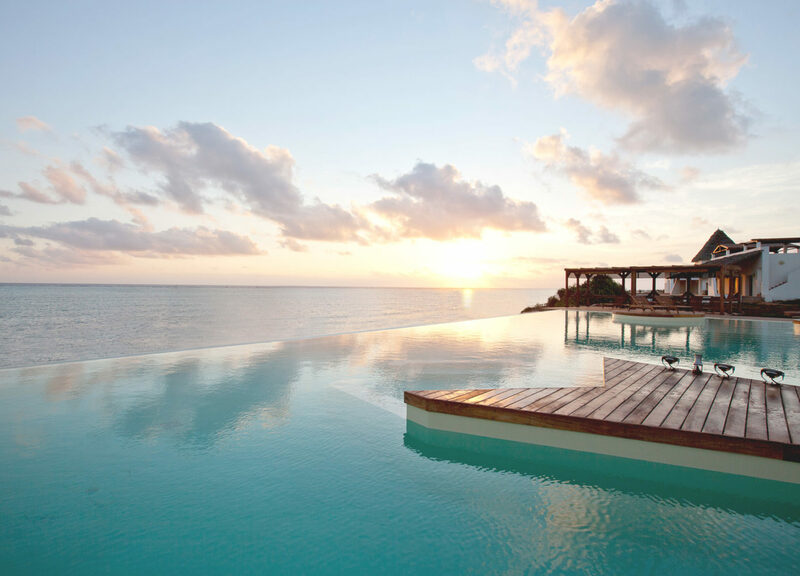 The infinity pool merges with the Indian Ocean at Essque Zalu Zanzibar. Dust in the air, the sky hazy, we wend our way through semi-chaotic traffic on the outskirts of Zanzibar City, towards the bumpy highway cutting across the island. Cows share the road, fish are laid out for sale, and gangs of goats pick through their hardy meal options alongside. Half-constructed dwellings in pastel hues give the impression of a doll’s house, their interiors open to the road. Piles of building materials abound, poles as tall as the trees they came from. The whirring of the SUV’s ancient aircon system struggling to combat the heat provides the soundtrack. Heading toward Pingwe, on the east coast, we are about to step into a world far removed from these works in progress. Along the way we are stopped by a police officer, who asks to see our car registration and temporary licenses. We soon get to the point — as it’s our first day in Zanzibar, he provides a warm welcome and lets us know he would like a ‘gift’ in return. Handing over a few dollars, we are cheerfully waved through. 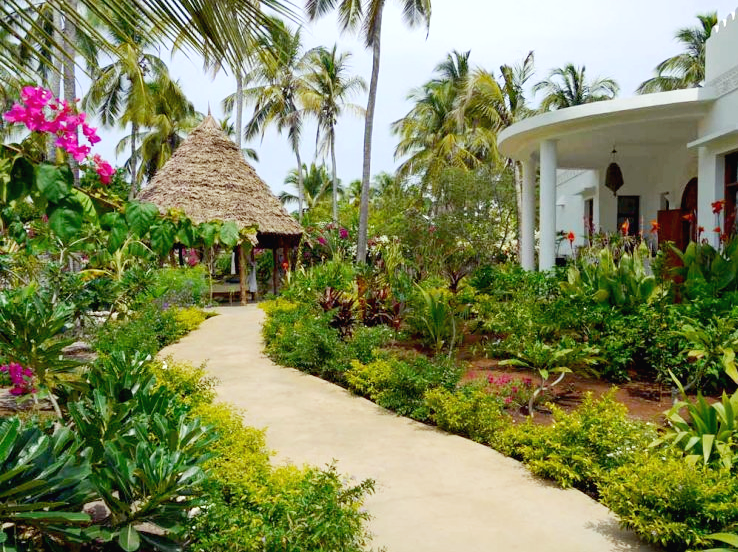 Tropical garden pathway leading to Villa Kidosho, Boutique Hotel Matlai, Zanzibar. Comprising just six suites, Boutique Hotel Matlai is an exclusive villa resort offering the utmost in privacy and personal service. Incorporating the island’s varied cultural influences into its architecture, the property distils the stylistic essence of Zanzibar. The four-room Asili House reflects Swahili building practices, all sticks and poles and thatching. The heart of the house is the alfresco lounge area, leading out to the pool and garden, and on to the beach. By contrast, the dual-room Villa Kidosho draws on Arabian style. White concrete pillars frame the opulent interiors. Matlai’s ‘M’ logo, inlaid into marble floors and carved into intricate wooden furniture, gives the impression less of a brand than of a royal crest. The common area separating the two suites includes a raised hookah-smoking nook, littered in gold cushions, and the decorative elements — a scimitar on the wall, a globe hanging from the ceiling — give a sense of being among the collected treasures of an explorer. 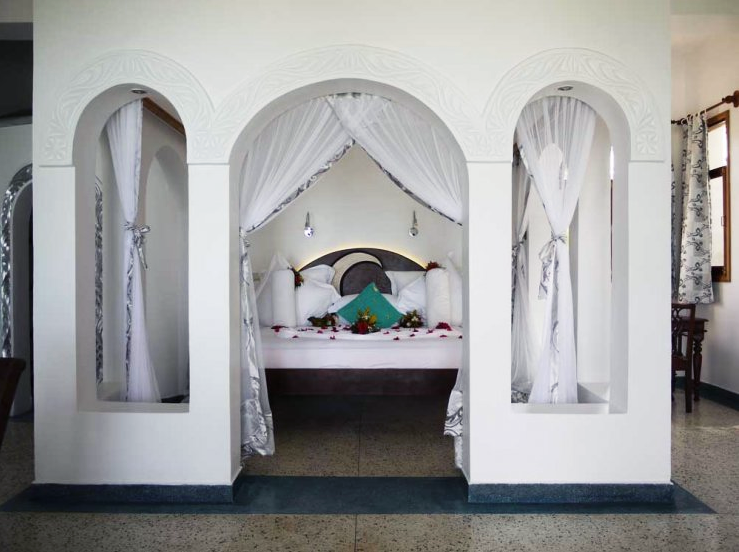 Arabian-style interior of Villa Kidosho, Boutique Hotel Matlai, Zanzibar. In the suite itself, the bed — where a page featuring a different traditional bedtime story appears nightly — is romantically walled-off and netted. The bathroom almost equals the bedroom in size, with a large walk-in shower and a bath overlooking the garden and turquoise sea beyond. Days are spent relaxing outside, the many means of doing so — from conventional sun loungers to a cushioned swing bed and a giant hammock — providing ample variety, while stepping into the infinity pool offers respite from the heat. An important personal touch here is Matlai’s bespoke meal service: timing and location, and even menu are flexible. We gravitate towards our private balcony to sample a range of delicious local and international dishes, naturally including Zanzibar’s abundant seafood — the crab soup is a must-try. A short walk along the beach reveals further offerings, with several bars providing the opportunity for a refreshing Tanzanian beer with one’s feet in the sand. 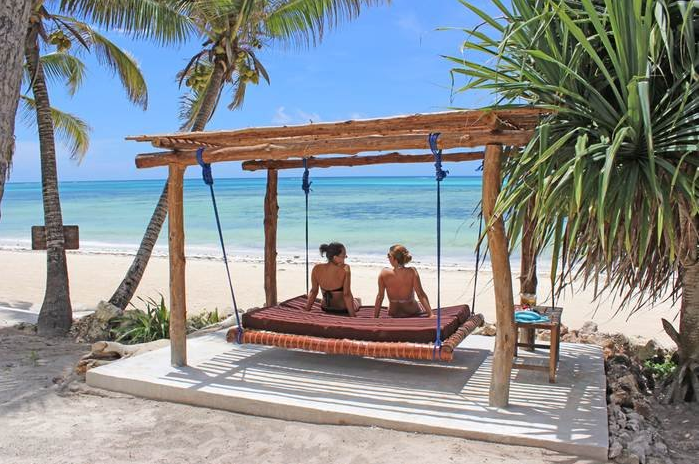 Enjoying the seaview from a traditional suspended daybed, Boutique Hotel Matlai, Zanzibar. Further along, we happen upon a unique restaurant: stairs emerge from the surface of the water, scaling a rocky outcrop topped by a white house with a thatched roof. The Rock is literally an island unto itself. Though accessible by foot at low tide, when the water comes rushing in visitors are transported by boat from the shore, two friendly ferrymen skilfully navigating the strong currents. A cocktail and perfectly-executed ceviche on the deck is an unforgettable scene: “We’ll always have The Rock,” as my friend would later say. 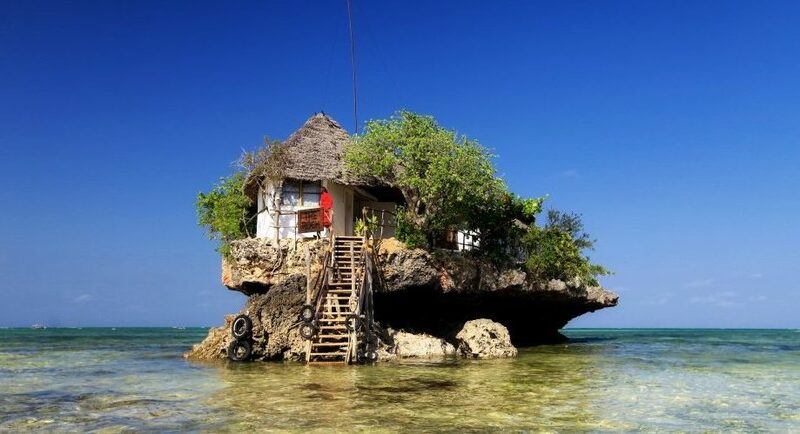 The Rock restaurant afloat on its own island in Zanzibar. It’s hard to tear ourselves away from Matlai, but there is much of the island yet to explore. 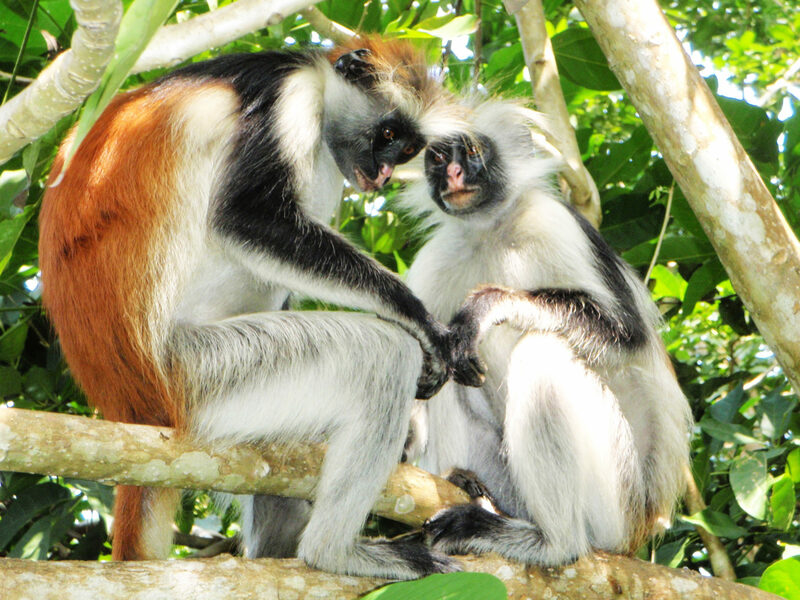 Stopping off at the Jozani Forest, groups of the endangered red colobus socialise in the trees, grasping with tiny hands and dexterous tails. Strolling among massive mahogany trees, we are lucky enough to spy the more elusive blue monkey. Across the road, a community-based sea turtle sanctuary acts as a local tourism initiative and supports the conservation of hawksbill and green turtles. The turtles voraciously devour the seaweed we offer them, and we meet two giant tortoises who graciously allow us to scratch their necks. Continuing on our way — another policeman, another bribe — we soon reach the chaos of Stonetown. Finding a carpark among the narrow alleys presents a small challenge, but one immediately forgotten on arrival at Emerson Spice. 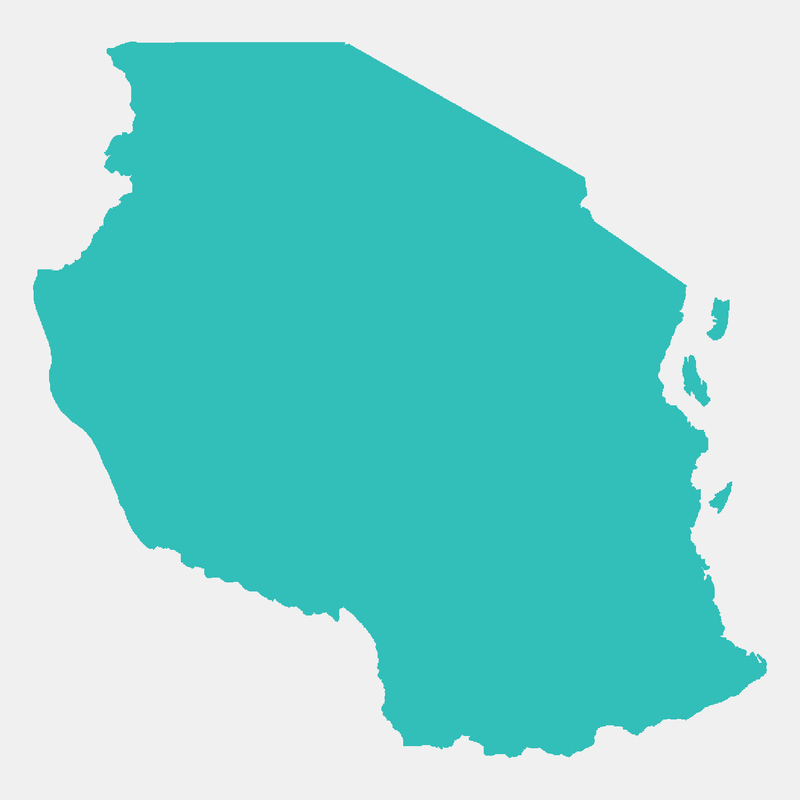 The Emerson group comprises three properties — two here in Stonetown, along with Unguja Lodge on the southern tip of the island. Emerson Spice is a conglomeration of three adjoining heritage buildings from the 19th century. One wing, in the Swahili-Arab style, was originally owned by the last Swahili ruler of Zanzibar, who used the property to meet with the Omani sultan. It changed hands to a Hindu businessman, who added two further wings reflecting his Indian background, and the place was put to use as a merchant house. Fast-forward to the 21st century, and hotelier Emerson Skeens converted the site into today’s hotel, with 11 individually-furnished rooms inspired by iconic women of classic film and opera. We climb the steep, uneven stairs to the top floor Desdemona suite, heavy luggage bravely transported by helpful staff. Articulated best by Skeens himself, the room allows for “presiding over the city, yet [it is] captured and isolated by the very walls and height that protect it. The room seems to disconnect from the cityscape it surveys. You can spy a lot…but you somehow feel unobservable.” Shuttered windows line two walls, allowing the breeze and sounds of the city to circulate inside. A balcony off the bathroom — kitted out with beautiful local hand-woven towels and handmade soap and shampoo from women’s cooperative Dada — allows for the best of this observation opportunity. 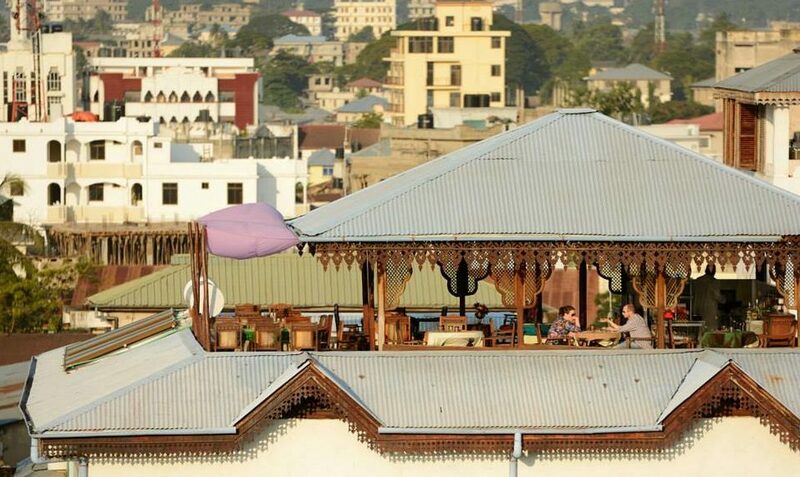 The rooftop Tea House restaurant at Emerson Spice affords expansive views of Zanzibar City. The rooftop Tea House restaurant is ideal for sundowners — the call to prayer echoes around the city as flocks of birds take to the sky and the sun sinks below the sea, the surrounding buildings thrown into relief. Also on offer is a five-course tasting menu which changes daily, featuring such delicacies as bungo fruit ceviche, lobster king roll, squid ink risotto, and choya and ginger givre. However, we opt for the à la carte options at the ground floor Secret Garden, ensconced in the ruins of another original building, the Shia Market House. It’s back to the rooftop for breakfast: strong coffee accompanies a beautifully-arranged fruit platter, toast with local honey, and a doughnut with homemade jam. The service is second to none — eggs ‘sunny side up’ has never been said so sunnily. A few twists and turns through the alleys and we arrive at Emerson on Hurumzi, another former merchant house turned archbishop’s headquarters. It is historically significant as the location where Arabian slave owners were paid by the British to emancipate their slaves in the 1870s. In the 12 rooms, three suites and two long-stay apartments, period furnishings are offset by bright contemporary colours. 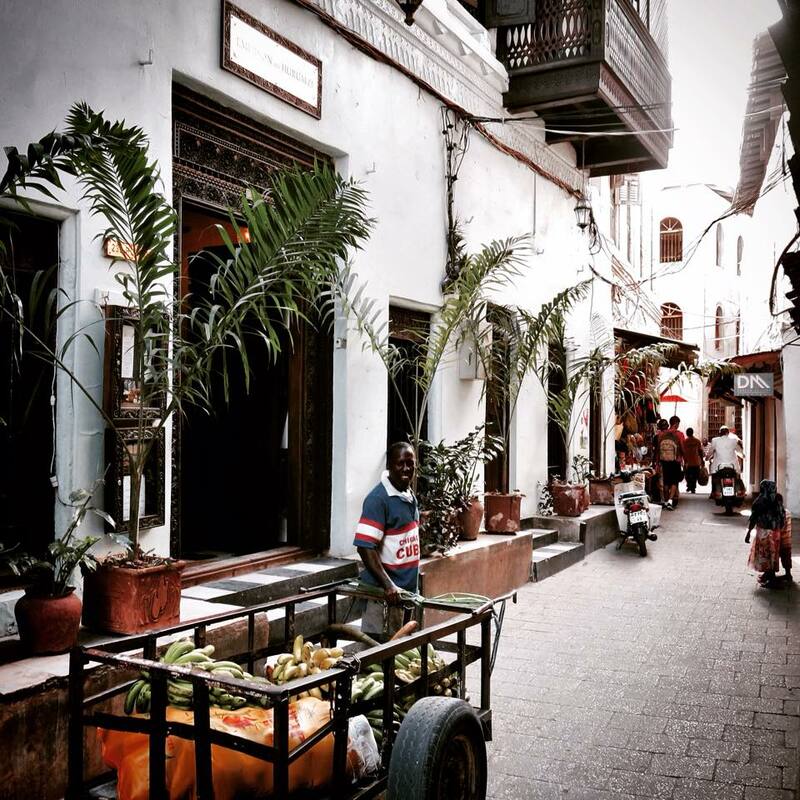 Hurumzi Street in Zanzibar’s historic Stone Town. Our room here is more connected to its surroundings — a balcony runs the length of the compact room, screened rather than walled-off from the interior, and the bath is open-air. A cloudy sky effect on the walls creates a further link to the cloudless one overhead. Everywhere in this space, one is conscious of city and sea. Ship horns blare; birds take off, dodge, and land again among the town’s famous architecture, while cats pick their way along rusted corrugated iron roofs. The problem of air-conditioning with this degree of indoor-outdoor flow is solved by an ingenious over-bed contraption. The rooftop here, the highest in town, is laid out in Arabic style, with low tables and lushly-patterned carpet and cushions. Bells from the nearby Hindu temple are reminiscent of the warning at a railway crossing, and I realise the mix of cultures here is as much in the sounds as the sights. The tastes, too: the set menu here encompasses Persian, Middle Eastern, Arab and African cuisine, emphasising the use of nuts and light spices. We begin with a cucumber martini, strong and fresh, and calamari with incredibly light baba ganoush. Salad with crunches of pomegranate sets off a spicy, citrusy fish and tender slow-cooked goat in a plum and hibiscus gravy — perfect with a bottle of Beaujolais and finished with an outstanding rice pudding with star anise and cinnamon, topped with pistachio, saffron and almond. Another bottle of wine is delivered to our room, and we sit out on the balcony in the cool night air. View across Stone Town to the bay from Emerson on Hurumzi’s Arabian-style rooftop. After this sophisticated city break, it is time to head back to the beach: our destination is Nungwi, at the northernmost tip of the island. A tide of schoolgirls heading home for the day surges along either side of the road, their long blue skirts and cream hijabs flowing behind. By now the checkpoints are expected and my bribery skills finely honed: the lecture I receive from this officer — “You’re lucky this time: I am understanding, but you could have met a cruel policeman.” — provides comic relief for the onward journey. On arrival at Essque Zalu Zanzibar, we are whisked inside and warned of the spectacle ahead. Having become somewhat used to incredible sights thus far on this journey, I’m sceptical. However, stepping behind a solid partition, we are greeted with an unforgettable view: a traditional makuti thatched roof soars above, higher than most cathedrals I’ve seen, while straight ahead lies the Indian Ocean, layers of turquoise and teal. 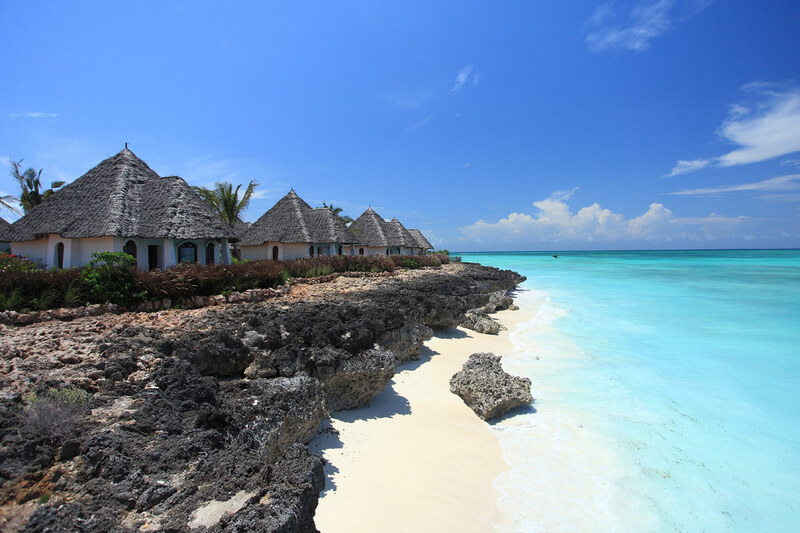 Absolute ocean front: luxury villas at Essque Zalu Zanzibar. Passing the striking Africology spa — reflecting an assemblage of influences in its treatment teepees decked out in Maasai checked fabric — we are shown directly to an oceanfront villa for which the term ‘spacious’ is an understatement. We have run of its ample living and dining space, a full kitchen, three large bedrooms, several expansive, light and airy bathrooms, and even a massage room for those wishing to take their spa treatments at ‘home’. Outside, one can lounge by the private pool, dine alfresco, or settle in to comfortable armchairs. I can immediately see the appeal of such a space for a group holiday. The villa is decorated with organic elements — wooden carvings are scattered about and a tree trunk forms the base of the dining table, while an ornamental whale spine bone evokes the life within the sea just out the window. The property, in the process of joining the Per Aquum family of resorts, is currently undergoing an interior design makeover: peeking inside one of the newly-finished garden suites, I am excited to see how its existing style has been translated into a more contemporary mode. Geometric forms mix with African and Arabic patterns and natural materials to a fresh and eclectic effect. The prospect of the extension of this aesthetic onto the larger canvas of the villas provides just one of many reasons to schedule a return visit. 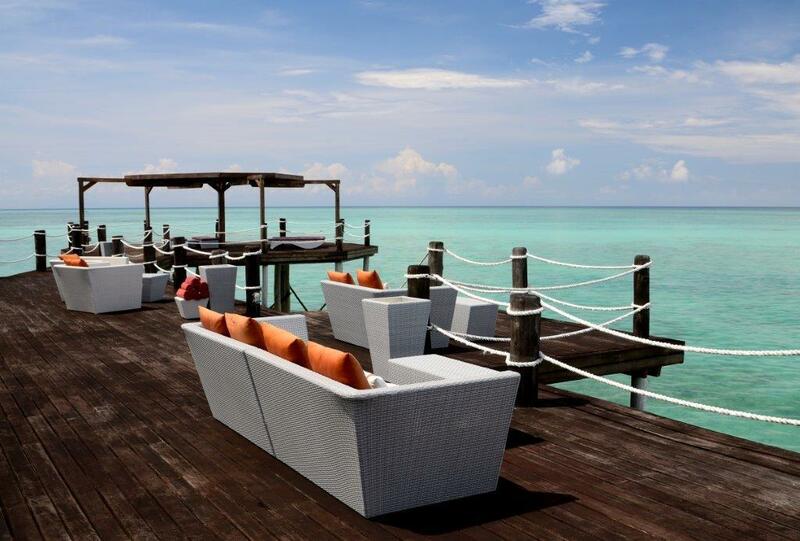 The place to while away an afternoon: the end of the jetty at Essque Zalu Zanzibar. A long jetty, which is to become a touchstone of our Essque Zalu experience, stretches out into the sea. It’s a sight to behold, but definitely not only to be enjoyed from a distance: after settling in, we eagerly make our way towards the restaurant and bar area perched at the end. With a breezy, nautical feel, The Jetty restaurant is the ideal place for a leisurely lunch. Cold beers, a refined tuna carpaccio and tasty chargrilled chicken and veges provide fuel for a relaxing afternoon on the outdoor sofas and daybeds scattered either side of the end of the pier. Day visitors come to resort to enjoy the view and the food, but we count our blessings to be able to stay right here. Come nightfall, we head to the Market Kitchen restaurant in the main building overlooking the infinity pool, now glowing turquoise. Staff in bright and breezy uniforms circulate, providing a warm welcome and friendly language lessons. Lanterns on the tables and hanging from trees illuminate the wide-ranging menu, featuring both regular items and daily specials. Highlights include a watermelon and feta salad, pork belly with tamarind soy glaze and zucchini fennel salad, urojo — a lemon soup with potato croquettes and beef skewer said to give plenty of energy — and an outstanding pineapple and coconut semifredo. 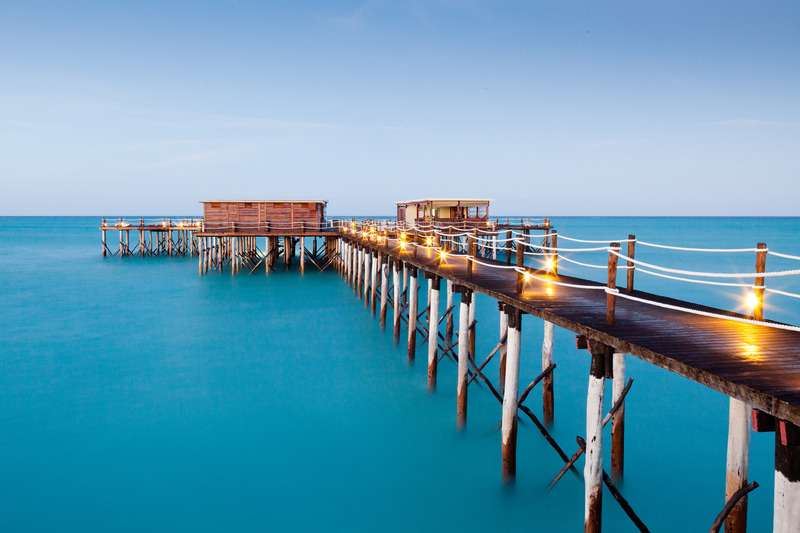 Essque Zalu Zanzibar’s iconic jetty stretches into the Indian Ocean. Returning to the villa, waves thunder and crash, spraying a fine mist onto the deck. Live music floats from the jetty, claps in time echoing across the water. Unable to resist, we head out for a slow walk along the lit-up boardwalk, for one last drink and a grateful goodbye to Zanzibar.